I present to you a Pea and Lettuce Soup, inspired by kitchen gardens, a stroll through the farmers market, and a recipe I found online. This is the perfect soup for early June, when the season’s last lettuces are harvested, herbs need pinching back and summer peas hold promise on the vine. Adaptability is one of the soup’s many virtues, and it may be enjoyed chilled, room temperature or reheated; a versatility appreciated with the unpredictable weather to which we’ve grown accustomed. When there’s a chill in the air, you could make the soup and serve it warm, then serve it cold the next day as temperatures rise. 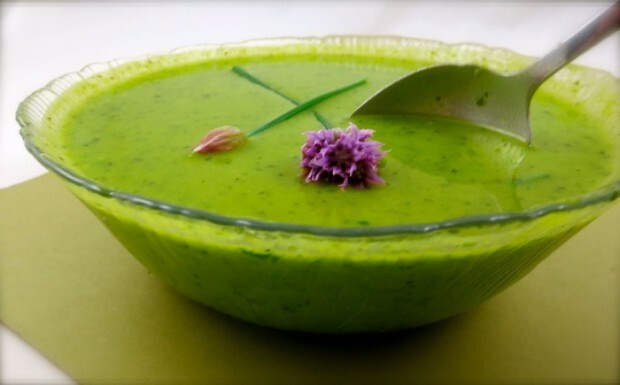 Indeed, on a sweltering summer day, savoring a cup of this chilled pea soup enhanced with a variety of fresh herbs, is as refreshing as swimming in a cool Michigan lake. And, as a strong crawl through water, it’s nourishing to boot. According to diabetes help.com, research indicates that eating a large, low calorie salad as a first course may help lower caloric intake through the rest of the meal — a dieting tip pubescent girls have bandied about locker rooms since grade school. Savoring a fiber-rich, vegetable-based soup — in fact, a liquid salad — serves the same purpose. Unlike a green salad, however, which tastes best dressed and tossed with vegetables just before eating, most chilled soups can be made several days in advance; indeed, this silky soup’s flavor intensifies after confinement in the fridge. The abundance of peas thicken the broth, and the longer it sits, the thicker it becomes. Double the batch, have a cup each day, and think of it as a delicious cleansing regime for the week. Most of us are no stranger to the chilled Andalusian classic, Gazpacho, and there are hundreds of interpretations, most of them nutritious and low in fat. This pea soup shares the same virtues, requesting we broaden our gazpacho horizons. Actually, it’s a variation on a French classic, Potage St. Germain, a soup usually served heated and predominantly composed of pureed green peas — petit pois — as well. The following recipe was adapted from Martha Rose Shulman’s Chilled Pea, Lettuce and Herb Soup. I used a bit less stock and switched up the amount of herbs, based on those that needed pinching back in my garden. I’m not growing parsley, so I omitted it. In my next batch I might try substituting the bibb lettuce for more piquant greens, such as arugula or watercress. The velvety soup can take the place of a salad or vegetable at a meal. It’s emerald brilliancy will set the mood for the most elaborate of dinner parties, capturing the limelight when served as a first course. Since it’s puréed, a spoon is not essential, so it may also be sipped from small cups while standing at a gathering. My husband, Richard, and I had no accompaniments for our deep bowls, but for a locally baked Jeff Renner baguette, creamy goat cheese and a crisp, herbaceous Sauvignon Blanc. In a large heavy-bottomed pot, heat 1 tablespoon of oil over medium heat. Stir in the leeks and a pinch of kosher salt. Cook, occasionally stirring, until tender, 4-5 minutes. 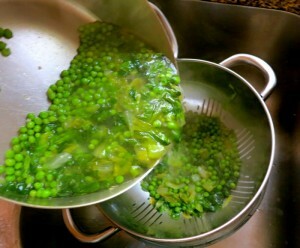 Add the peas, lettuce and 5 cups of stock. Bring to a boil, then cover and reduce heat and simmer for 5 minutes. Remove from heat. Drain through a strainer set over a bowl, and allow the vegetables and stock to cool several minutes. Serve garnished with additional chives, tarragon and/or mint.